This is an ancient Korean horse racing game upon which several popular modern board games have been based. 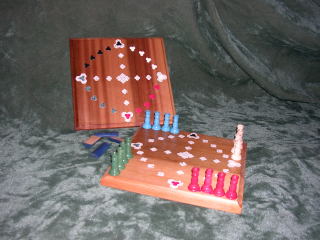 The object of the game is to race around the board to get your four horses home first. Instead of using dice, sticks are rolled. In the original version, this is a team game, in which two players working together, try to get their horses home first.